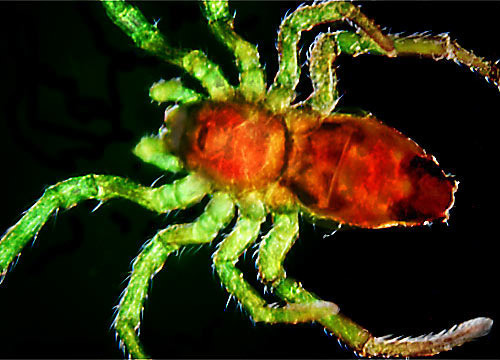 On the spider abdomen, several silk glands hold viscous liquids that pass through minute tubes called spinnerets; normally a spider has three pairs. Upon being drawn from a droplet, the liquid protein structurally rearranges to polymerize into solid silk threads. Interestingly, once the protein leaves the gland, its molecular mass increases from 30.000 Dalton to about 300.000 Dalton to become a silk fiber. The catalyst involved in this transformation remains a mystery. The silken threads are incredibly fine — about 1/10,000 of an inch in diameter, 30 times smaller than the diameter of human hair — yet it is strong enough to stop a bee in full flight. Although spider silk is stronger than steel, the web can absorb energy that causes it to stretch, up to 140 percent of its length, without bouncing back. Even at low temperatures, the gossamer strands maintain their amazing structural properties.